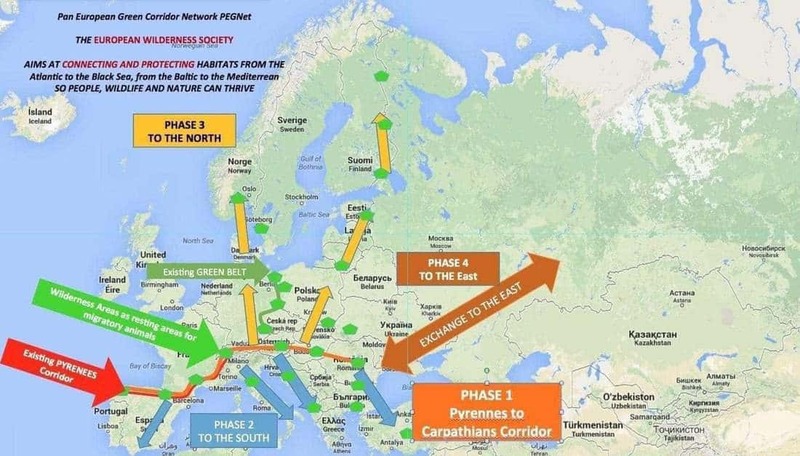 Based on the enthusiastic response to our Pyrenees to Carpathians natural green corridor project, our Society decided to develop the idea further into a Pan European Green Corridor Network. We believe that such a network can be set up for the implementation and promotion of wilderness and wildlife preservation across the continent. The Pan-European Green network (PEGnet) initiative aims to create a vast unbroken ecological corridor connecting natural landscapes from the Atlantic coast to the Black Sea and from the Arctic Circle to the Mediterranean. This initiative will be implemented in various phases like connecting mountains in Portugal, the Cantabrian Mountains, the Pyrenees and the Massif Central to the Alps, and eventually, the Carpathians and the Balkans, along which natural ecological processes are allowed in creating a landscape rich in biodiversity to the benefit of nature and humanity. Europe is a highly fragmented continent . Vast areas of Europe’s last great wild places have also been transformed into urban zones or cut up by an increasingly dense transport network. Recent statistics from the European Environment Agency illustrate just how significant these changes are. In a single decade around 5% of EU territory has been covered with concrete or otherwise converted into completely artificial surfaces including industrial areas, holiday resorts and infrastructure. Europe’s motorways have increased in length by almost 41% (15,000 km) within that same period and will increase by 12,000 km in the years to come. In densely populated countries like Belgium, the average size of contiguous land units not dissected by major transport routes has been reduced to just 20 km² (EU average is 130 km²). Phase 3: linking the mountain corridor to the North: the inclusion of the Baltic states, Fenno-Scandinavia and the European lowlands in the large scale green corridor concept. Phase 4: from the Carpathians to the Ural and the Caucasus. As wilderness knows no political boundaries, we must recognise that differences in political views shall not stop us to make our PEGnet truly European! This initiative is a classical win-win, because – wildlife will benefit from more space to freely roam – human will benefit from more ecosystem services such as flood and climate change mitigation!